It was Mother's Day and I took my father and grandmother to dinner. Nice Bistro is a French restaurant that's been around over for 20 years. It's family owned and everyone that works there speak French. Neat! 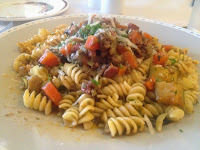 They have the regular dinner menu and a $30 prix fixe menu with the daily specials. Bonus: Nice Bistro sources locally. My father and I went with the prix fixe and my Nan had one of the specials. The starter we chose was the Zucchini and Carrot Soup. It was dairy-free and vegan friendly. 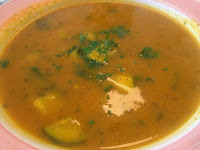 I was worried that the soup would be too sweet because of the carrot, but it was well balanced and creamy. It was seasoned with black pepper and parsley and not a lump in sight. Nan stole a few bites of mine, so I wouldn't be surprised if I come over for her play on this dish! Now for the mains. We all had specials: I had the Salmon, my dad had the Lamb and Nan had the Beef Bourguignon(do not ask me to pronounce it, please). The Beef Bourguignon is a pasta dish topped with stewed beef and veggies cooked in red wine. 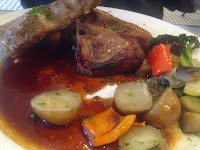 It was a large portion and you could really taste the red wine flavours in the beef. Nan enjoyed it. Dad's lamb was a sizeable portion. He was told he got the last serving and it was a good one. Tender, juicy and full of flavour, he didn't leave a morsel on his plate. My salmon was seasoned with a rub rather than a sauce; I've never had it this way! It was flaky and moist and the rub had a some heat to it; reminded me of a steak rub. The portion was small, but the spices packed a punch. 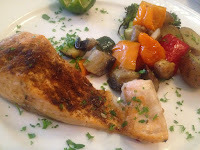 The lamb and salmon were both accompanied with roasted veggies. So good! For dessert, my dad chose the Tarte Tatin and I chose the Poached Pear. 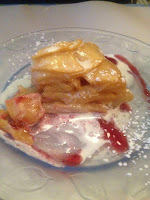 The Tarte Tatin was a fresh apple tart, very similar to apple pie, but compact and not too sweet. The apples were crisp and the pastry was great. The Poached Pear wasn't what I expected. 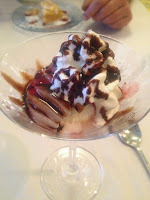 I expected it to be very sweet and syrupy, instead it was beautifully displayed sliced in a martini glass with whipped cream, dark chocolate sauce and some the pear syrup. The dark chocolate and whipped cream cut through the sweetness in the syrup allowing the flavours of the wine the pears were poached in to come through. The service was phenomenal. All of the staff are delightful and Chef Bernard stopped at every table to make sure everyone was enjoying the food. Thank you for making Mother's Day delicious!